Headache is one of the most common reasons a person consults any doctor. It is also, according to a recent survey by a leading consumer magazine, the single most common condition for which people are dissatisfied with the treatment they have received. There are many different types of headaches, and the most common are tension (muscle contraction) headaches and migraines. Regardless of the type of headache, effective treatment starts with the identification of factors that are unique to each patient and a clear diagnosis. At Total Body Chiropractic, the approach we take to the treatment of headache sufferers involves attempting to detect those specific factors that are involved in the development of each individual’s problem. We then employ a strategy that is personalised to each patient and is designed to correct these factors to the fullest extent possible. This may involve treatment at Total Body Chiropractic alone, or may involve treatment in conjunction with another health professional such as a neurologist or pain specialist. What are the Most Common Headache Types? Most commonly, a person suffering from headaches will have either the tension headache or migraine headache types. 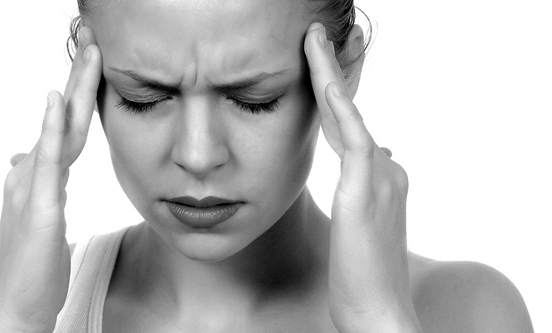 However, the distinction between these headache types is not as simple as it would seem. In fact, some experts believe that there is no real distinction between these headache types but, rather, they all share a common underlying cause that has several different contributing factors. Tension headaches are sometimes referred to as muscle contraction headaches. They are the most common type of headaches and can be felt anywhere in the head, but the temples and forehead are the most frequent areas. They are also associated with tightness in the head or scalp. They are not typically associated with other symptoms such as nausea, numbness or visual sensations but can be worsened by emotional stress. Migraine headaches are usually more severe than tension headaches and generally occur in attacks that can last from a few hours to a few days. They are often accompanied by other symptoms such as nausea, vomiting, increased sensitivity to light and sound, numbness or coldness in the hands or tremor. In some cases, the patient experiences an aura – a period of 10-30 minutes preceding the headache during which the person experiences symptoms such as jagged lines or flashing lights before the eyes, strange odors, difficulty speaking or numbness. One of the most common causes of headaches that do not originate in the head is called a cervicogenic headache. The source of pain stems from structures around the neck which may be impinged or damaged. These structures can include joints, ligaments, muscles, and cervical discs, all of which have complex nerve endings. When these structures are damaged, the nerve endings send pain signals up the pathway from the nerves of the neck to the brain. During this process, the signals communicate or intermingle with the nerve fibres of the trigeminal nerve. Since the trigeminal nerve is responsible for the perception of “head” pain, the patient experiences the symptoms of a headache. Cervicogenic headaches are characterized by pain on one side of the head with associated neck pain on the same side. A patient with these headaches perceives pain in the head, but the actual source of the pain lies in the cervical spine. Cluster headaches occur in “clusters” which can occur for days, weeks or months at a time, then disappear for up to a year or more. Temporal arteritis headaches are caused by inflammation of an artery and occur on the side of the head. Sinus headaches are caused by sinus infection. In addition, more potentially serious causes of pain in the head must be taken into consideration. How Can Headaches Relate to the Neck? As was stated above, there are several different contributing factors that lead to the development of tension headache, migraine, or the mixed types of headaches that fall somewhere in between these types. One of these is cervical spine dysfunction. This can consist of joint dysfunction, in which the joints of the neck lose their proper mobility, muscle dysfunction, in which the muscles of the neck become either excessively tense or excessively limp or instability, in which the ability of the nervous system to properly regulate these joints and muscles becomes disturbed. Most commonly, a combination of these occurs, and the result is pain. This pain can be perceived in the neck or referred pain can develop, causing the pain to be perceived in the head. How Can Referred Pain From the Neck Cause Headache? The area in the brain to which the nerves that sense pain in the head send their signals, is the same area to which the nerves that sense pain in the neck send their signals. Because of this, the brain is not always able to localise exactly from where the pain is arising. This, coupled with the other factors that contribute to tension and migraine headache, causes the pain to primarily be perceived in the head. What Are the Other Factors that Contribute to Headache? In addition to dysfunction in the neck, most headache conditions involve a disturbance in the control of the chemicals and blood vessels of the brain. The delicate balance that exists in the brain can be altered, leading to conditions that are favourable for the development of headache. If these conditions are combined with the presence of dysfunction in the neck, the likelihood of developing a headache becomes greatly increased. Are There Any Other Components That Are Significant in the Development of Headaches? There are certain secondary factors that can contribute to the headache, or can be triggers for a headache episode. These include stress, emotional upset or certain foods like chocolate or red wine. Also, hormones, such as those related to the menstrual cycle, can play a role.